The holidays, while portrayed as this amazing time with family, friends, and presents, can actually be a bit divisive. The pressure of giving gifts and the financial strain, the expenses that come from holiday traveling, the familial issues or the changes in routine, all of these things can actually cause quite a bit of stress. At our Boulder dermatology clinic, we hope that you’re not stressed during the holiday season. But if you are, there are a number of things you can do to alleviate some of these negative or anxious feelings. Not only is it good for your overall well-being and health, but it helps your skin’s overall health as well. 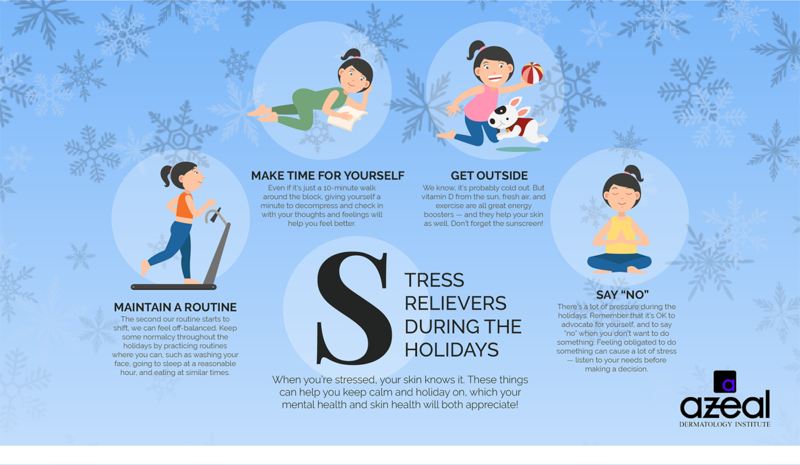 When you practice these stress relievers, you’re improving both your experience during the holidays and your skin’s health. 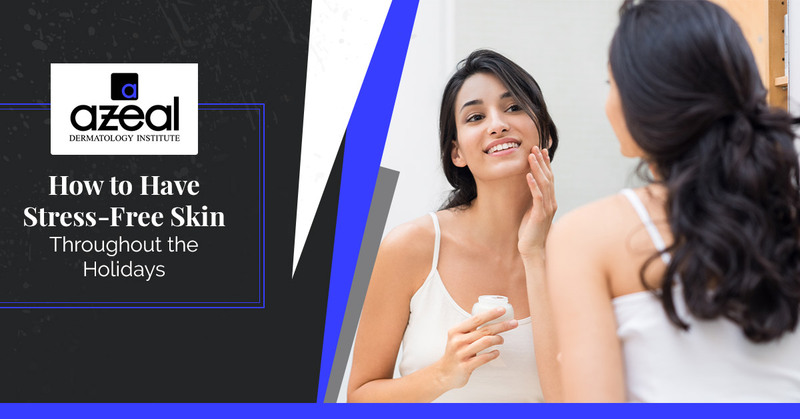 Try some of these out from Azeal Dermatology, and if you’re in need of cosmetic, aesthetic, and general dermatologic services, give us a call! The post-holiday exhaustion is very real, and it’s usually because our routines get thrown out of whack during these festive times. Even when things are crazy, do whatever you can to follow some semblance of a routine. Wash your face and brush your teeth as normal. Go to bed as close to normal as possible. If you’re used to eating veggies every day and now you’re suddenly eating all those deliciously rich foods, try to sneak some carrot sticks or cucumber slices into your day. Your body will thank you, which means your skin will as well. Being surrounded by tons of people is fun for some and anxiety-inducing for others, but either way, it’s a lot of stimulation. Even if you don’t think you need to make time for yourself, you’ll feel more rested and calm when you give yourself this gift. It’s important to reflect on your interactions, your feelings, and your thoughts, and having some time just for yourself puts you in a better place to be there for others. Plus, it’s the holidays! You deserve to relax. Whether it’s rainy, snowy, or sunny and hot, you should take some time to get outdoors during the holidays. For starters, there are so many fun things to do! Winter activities like skiing or sledding, walking around and seeing the holiday lights — you simply can’t go wrong when going outside during this time. But on top of that, getting exercise gets your heart pumping, which actually sends extra nutrients to your skin cells and improves their health. Exercise is also an excellent mood booster and stress reliever. The number of obligations and engagements we have during the holidays are usually astronomical. This is your reminder that you have every right to listen to your body and needs, and to say “no” to situations that you don’t feel comfortable with. Whether that means ditching a holiday party or saying no to expensive plane tickets or presents this year, it’s OK to think about what you really want to do, and to advocate accordingly. Azeal Dermatology is all about self-care and stress relief. We know that one of the best ways you can recover from the holidays is by treating yourself to a visit with our dermatology clinic in Boulder! Enjoy the season, and we look forward to seeing you.